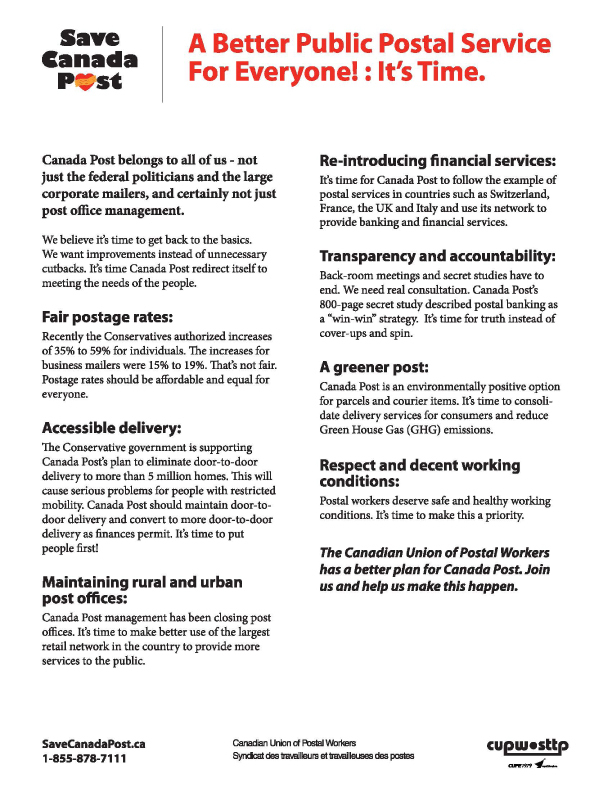 You can see the Committee’s full report entitled The Way Forward for Canada Post, as well as the Conservative Party's and New Democratic Party’s dissenting reports at http://www.parl.gc.ca/Committees/en/OGGO. Please share your input with us at feedback@cupw-sttp.org. You can get updates and more information at: CUPW.ca/canadapostreview. You can send a message in support of postal banking or you can download and print a hard copy. Need to keep up-to-date on the campaign? Sign up for the campaign newsletter below. Talk to your family and friends about what the public postal service means to you and why a public review and postal banking are important. You can find additional resources below to help. Sharing this site and your actions on social media is another way to mobilize more people. Is your city or municipality on the list of postal banking supporters on this website? If not, would you meet with your municipal representative and encourage them to move a resolution, either in support of postal banking or a public review of Canada Post? Can your help organize an event or information session in your community? We can give you resources to help. You can also volunteer to help a nearby CUPW local in their campaign activities. Please connect with a Save Canada Post campaign coordinator at savecanadapost@cupw-sttp.org or call 1-855-878-7111. Please feel free to post and share content from this website using the embedded share tools. Post and send us pictures of your involvement, too, using the hashtag #savecanadapost to make sure postal workers will see your support! Together we can build a successful 21st century post office that meets the needs of Canadians and creates new revenue streams, such as postal banking. We appreciate every bit of support. Download and sign the petition urging the Government of Canada to instruct Canada Post to add postal banking, with a mandate for financial inclusion. A Better Public Postal Service For Everyone! : It's Time. A member of CUPW's Sherbrooke local has created a website entitled A Human Factor. Canada Post belongs to all of us - not just the federal politicians and the large corporate mailers, and certainly not just post office management. We believe it's time to get back to the basics. We want improvements instead of unnecessary cutbacks. It's time Canada Post redirect itself to meeting the needs of the people. Canada Post and the Conference Board of Canada have been out there talking about how much money the post office is losing or about to lose. Register here to stay in touch. By submitting this form, I give my consent to the Canadian Union of Postal Workers to communicate with me at my email address provided.